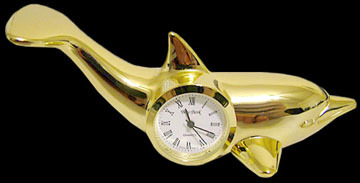 This magnificent dolphin clock is made of highest quality 24K Gold Plating over solid brass. The detail and craftsmanship is unparalleled. It is intricately detailed to add beauty to your home or office, a unique gift for the dolphin lover. Includes a beautiful gift case. 4 inches L. x 1.75 inches H.